To build a VANET/5G Cloud Testbed in Central London. This project is part of a Research Collaboration between Middlesex University and Kings College London (KCL). The deployment of Connected Vehicles (CVs) will transform our lives in fundamental ways leading to less stressful commuting, shorter journey times and a greatly reduced number of accidents. This is especially relevant in an urban environment such as Central London in which there are diverse modes of transport and also high densities of traffic. This project will therefore help us to understand the effect of CVs on our transport and communication infrastructures and thus will give us better insight into how to build and deploy an Intelligent Transport System (ITS) as well as future mobile systems including 5G. The project will use Vehicular Ad-Hoc Network (VANET) technology, which will provide low latency and high bandwidths to ensure seamless connectivity between the vehicle and the communication infrastructure. 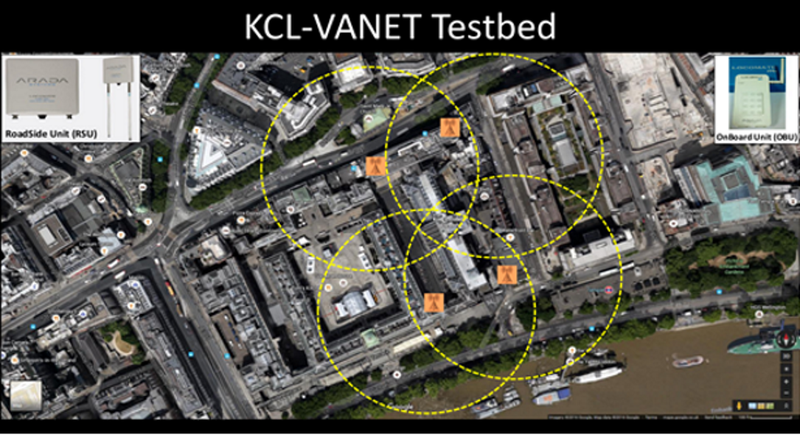 The testbed will be located at Kings College London (KCL) along the Strand in Central London. Once the testbed is built and deployed, a large number of applications will be written and tested to understand their communication needs in terms of bandwidth and latency in this highly mobile environment. This will be used to help develop standards for emerging communication technologies such as 5G. The testbed will also be used to study how diverse modes of transport such as driving, cycling, walking, taking the Tube or bus, etc., can be used to provide an integrated transport environment for the urban commuter. This testbed in Central London will also be connected to the Middlesex VANET testbed, which is located in Hendon and will soon encompass parts of the A41. The Middlesex testbed is being used to study the interaction between urban and motorway traffic, vehicular safety and maintenance issues as well as to develop techniques for wide-scale deployment of ITS. The two testbeds will form a VANET Federated Cloud system that would allow researchers to study these different environments simultaneously. The project will also include an extensive 3-month VANET Trial of the Federated VANET Cloud system. The results of the project will comprise a detailed project report, the dataset of the trial as well as software and applications developed for the project. The Project Co-ordinators are Dr Glenford Mapp, Associate Professor, Head of VANET Research at Middlesex University and Professor Mischa Dohler, Head of the Centre for Telecommunications Research (CTR) at Kings College London. The Principal Investigators (PIs) who will work on the project are Dr Arindam Ghosh for Middlesex University and Dr Fragkiskos Sardis for Kings College London. The funds for the project will be administered by Middlesex University. The project will begin in October 2016 and the final results will be submitted by the end of February 2017. Monthly progress reports will be submitted to Department for Transport (DfT). Project Co-ordinators – Dr Glenford Mapp (Associate Professor): g.mapp@mdx.ac.uk, Head of VANET Research at Middlesex University.